Beachside has everything you need for your perfect surfing holiday in Cornwall. Cornwall is the surfing capital of the UK and there aren’t many places you can stay that are closer to the waves than Beachside. Our range of self catering accommodation and camping and touring pitches overlooks the well-known surfer’s playground that is St Ives Bay, home to the beaches of Gwithian and Godrevy. 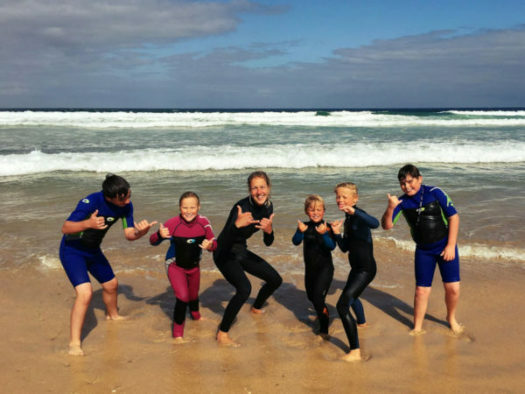 The north coast of Cornwall enjoys good surf conditions most of the year, giving both learners and those with more experience a great time in the water. Beachside’s chalets come with plenty of room for surf gear in the covered patio area, and our on-site shop offers hire of equipment. If you want to take a break from the swell, we’re surrounded by a wealth of other outdoor activities including horse riding, sea fishing and cycling, and there’s always our outdoor heated pool, games room and bar for post-surf recuperation. Surfing is an amazing and exhilarating activity for all ages, whether you are a complete beginner or have done it before. If you are keen to get into the sea and ride the waves, having a surf lesson is a must, a memory you will never forget, whilst on holiday here at Beachside! Our surf lessons are run on the beach right in front of Beachside by our partners Beach Shack Surf School. Beach Shack Surf School offer surf lessons throughout the year. All their instructors are experienced keen surfers, with ISA (International Surf Association) qualifications and have surfed around the world. They will guide you through everything you need to know to get you up and riding waves. All the equipment needed is provided for you. They run beginner lessons where they teach you about the surfing environment and how to stay safe in the water. They will teach how to paddle the board, catch waves and to stand up, the ‘pop up’. You will get constant specific feedback to make sure you know how to improve. They will give you advice and help throughout the lesson, but also make sure you leave the lesson with a solid level of knowledge, so you feel confident surfing again. They also run improver lessons for people who have surfed a few times but need some help to improve. These sessions are designed for surfers that are looking to develop the basic skills. You might need to improve your ‘pop up’ or paddle technique. You might be at the stage where you can surf straight, but need help going along the wave, keeping speed or basic turns. With small groups, they use video and specific feedback to help you improve and take your new-found skills to the waves. Improver sessions will also focus on choosing the best waves, identifying the best place to catch the waves and the easiest place to paddle out. You can bring your board if you have one (or use theirs) and they will ensure you get the most out of your lesson. Beginner and improver lessons from £35 per person, each session lasting about 2 hours. The Beach Shack has a great selection of equipment that you can hire such as surf boards, paddleboards, sit on kayaks, body-boards and wetsuits. The Beach Shack also offers hot and cold drinks, ice-creams and snacks to take away and enjoy watching the beauty of our ocean. Surfing is totally addictive and after one lesson you will be buzzing (and ready for a nap! ).